After twenty-five years of building cabinets and furniture, one of the most dramatic improvements in my work with hand tools happened when I went from sharpening on a bench grinder and oilstones to a water-cooled mechanical stone. I haven't totally abandoned the grinder, but the manual stones haven't seen the light of day for a while. It's not that the water-cooled sharpener is any quicker, but it sure is a whole lot more fun and less work. And the edge is definitely superior to anything I ever achieved during a quarter of a century of sweating. Being exceptionally cheap, I first invested in a low budget Woodtek machine, which has served us well and still produces an excellent edge on planes and chisels a decade down the road. I locked the guide at 25 degrees for the primary bevel on bench chisels, and I keep an old 2-liter pop bottle of water beside the tool so I can refill the resevoir as needed. 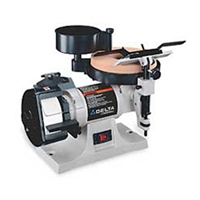 The machine takes up less than one square foot of bench space and has a 7" wheel that spins at 420 RPM for ultra-smooth, precise sharpening. Running nearly vibration free, it easily sharpens plane irons, knives, small planer knives, drawknives, scissors and other tooling. An adjustable, wide built-in guide makes it easy to follow the correct angle for any type of edge and the machine only weighs 13 lbs. It came with a 1000 grit fine stone, and I invested another few dollars in a 400 grit version, just to speed up things a little. Woodworker's Supply still lists it. 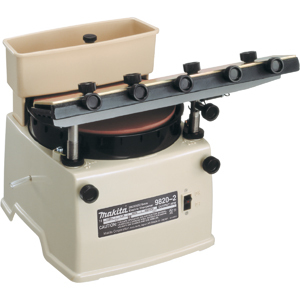 The wheel on a water-cooled sharpener is either vertical (like the new Tormek T-8 shown at right) or horizontal like most machines. The orientation is important. A vertical wheel continuously dips into a trough of water, while the others all use a resevoir above the stone which has to be regulated. In addition - and this is the big difference - the Tormek uses the edge of the stone, while the others all use the side. That means that a chisel being sharpened on the Tormek enjoys the same speed across the width of the blade. All of the others, by using the side of the stone, suffer from the same dilemma: each revolution of the stone presents a short contact with the blade near the center, while out at the edge the blade meets several more inches of stone in the same period of time. That means that the chisel is being sharpened more at one side than the other. The most important distinction between Tormek and all of its competition is the wide range of tool holders and accessories available (plus the owner's handbook). The company has complemented a superior grinder with accessories that help you get the job done right, and quickly, and with a short learning curve. But even without the jigs, this is still a better grinder. 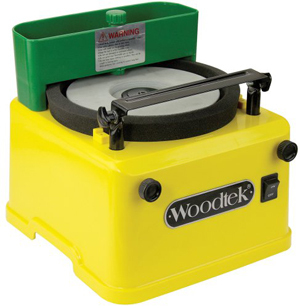 The stone is the best quality grindstone available, with a unique ceramic binder that yields unmatched consistency. The porosity of the stone, the cohesion of the binder and the grain size are all matched for a perfect balance of fast cutting action and long stone life. Add to the quality of the grindstone the following features: continuous duty rated motor, gearless drive, removeable water tray, plated rust resistant hardware and a patented angle-setting gauge, and you've got the best grinder on the market. 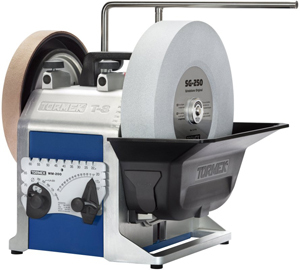 But that still isn't the whole story, because Tormek also incorporated a leather honing wheel on the other side of the grinder to let you finish the sharpening process right on the machine. The Tormek bevel angle setting guide can be adjusted according to the diameter of the stone, and the universal support bar has a micro adjust for an easy and accurate setting of the bevel angle. On flat (horizontal) stones, the wider the blade, the bigger the speed deviation across the edge of the tool. It's not a huge problem, and I've dealt with it rather successfully by presenting the blade at an angle to the axis of the stone.On the other hand, all of these side grinders give you a flat bevel, while the Tormek delivers a hollow-ground profile that matches the circumference of the stone. And a hollow grind is easier to touch up or add a micro-bevel, because there's less steel to remove. One thing that sets various models apart is the tool rest options that they offer. Depending on what you want to sharpen (lathe skews, carving gouges etc. ), you may want to ask if there's a jig specifically designed for that tool. 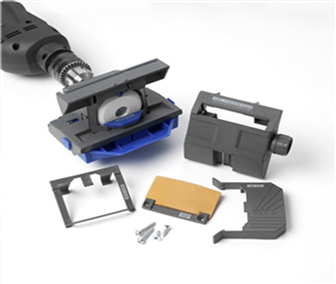 Tormek offers everything a shop could possibly need, and most of the others can cover the more commonly used tools in your arsenal. Delta no longer makes its Model 23-710, but it can often be found used. It has both a dry grindstone and a wet honing stone. The 1/5HP motor runs a 5" diameter, aluminum oxide dry wheel (120-grit), and an 8" diameter by 1000-grit wet wheel. Both have decent tool rests and the dry wheel comes with an eye shield. The sliding tool holder secures lathe turning tools, carving chisels and plane irons, and it may be used on either wheel.The body is cast iron to reduce vibration, and the wet wheel has front and rear splash guards for retaining water spray during operation. This machine is 16" wide, 21" deep and 13" tall. It weighs in at a substantial 42-1/2 lbs. Delta has replaced the 23-710 with a family of 6" and 8" variable speed dry grinders, the 23-196, 23-197 and 23-198. The 98-202 from Makita has been around for a long time and it is a very quiet machine that sharpens jointer and planer blades up to 15-3/4'' long. The large aluminum oxide wheel (7-7/8") offers precise sharpening, while the 560 RPM motor gives a fine finish. 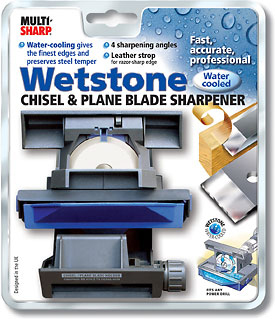 The water feed keeps blades cool and the machine is ightweight (26.9 lbs) for easy transport. The motor draws 1.1 Amps. We found a nice site by Davis Reed Smith who has converted one of these machines into a total sharpening station by designing custom tool rests and jigs, and he even managed to upgrade the water system. To see what Davis has done, click here. The British company Multi-Sharp offers a VERY economical water-cooled system that sharpens chisels and plane blades from 3/8" to 2-3/8" wide. It's powered by a drill, and offers 25º, 30º, 35º and 40º sharpening angles, and includes a traditional leather strop.